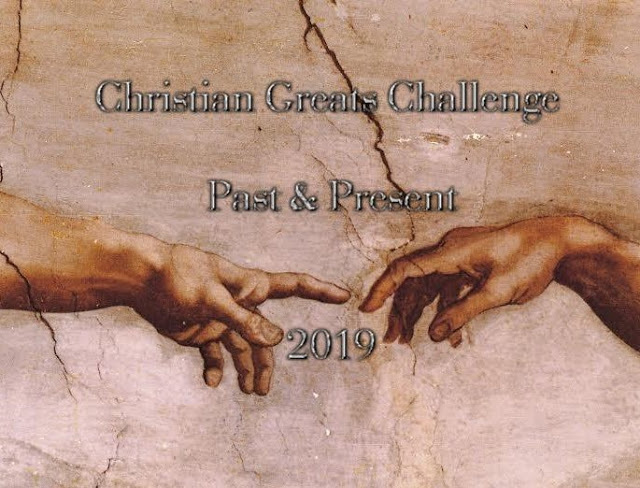 My friend Carol is hosting an online reading club this year: “Christian Greats Challenge: Past and Present.” Carol is an Australian homeschooling mom who writes the most delightful and thoughtful book reviews. She planned this challenge’s categories partly to counter what C. S. Lewis calls ‘chronological snobbery’, defined as ‘the uncritical acceptance of the intellectual climate common to our own age and the assumption that whatever has gone out of date is on that account discredited.’ Reading history of all sorts helps to counter this snobbery, so the categories in this challenge are mostly historical. I have not finalized my choices in all categories and am including a range of possibilities, focusing on my Dutch heritage. A lot depends on homeschooling and on my health, so I cannot make definite plans. However, I will at least be able to do the minimum one or two books Carol asks for, and perhaps the full 10 or more. And, over the next few years I want to read all of these. As you can tell, this is a very relaxed challenge. If you also want to read and discuss some historical Christian books this year you can sign up here. 1) A Book on Early Church History (up to about 500 A.D) or a book written by a key figure who lived during that time, or a biography about that person. Reread Simonetta Carr’s biographies from this time period. Bavinck on the Christian Life: Following Jesus in Faithful Service by John Bolt, a book about the great Reformed theologian Herman Bavinck. Always Obedient: Essays on the Teachings of Klaas Schilder, edited by J. Geertsema, an examination of Schilder’s life and thought. I will probably substitute some other book for this category (see #10 below) since I cannot stomach even the most-loved allegories like Pilgrim’s Progress and The Chronicles of Narnia. I have several options here and probably will read more than one of them. Or perhaps The Tao of Right and Wrong by Dennis Danielson since I plan to attend a talk by Danielson this year. “This book “re-invokes C.S. Lewis’ use of the Tao in the Abolition of Man to show the transcultural ground of moral judgment, codes of ethics, and standards of right and wrong. This book is a rejection of moral nihilism, and a recognition of life-affirming moral realism founded in the Tao.” Reading it would probably also require reading Lewis’s The Abolition of Man, so this would be a stretch. 6) A Missionary Biography or A Biography of a Prominent Christian who lived any time between 1500 A.D. to 1950 A.D. The influential Dutch theologian Klaas Schilder wrote a famous trilogy, Christ in his Suffering, Christ on Trial, Christ Crucified, and I want to revisit that. In English, of course, and probably only the first volume this year. Jayber Crow by Wendell Berry; I am slowly working my way through Wendell Berry’s fiction and have long been eager to meet Jayber. Father Brown: The Essential Tales by Chesterton, which I plan to read aloud to my girls. Groen van Prinsterer (1801-1876) was an influential Christian politician, writer, and newspaper founder in the Netherlands, and I have long wanted to read his trilogy on history, Unbelief and Revolution. To read about the revolutions that had happened just previously would be a fascinating study, and probably insightful for today. This project may be too ambitious, but at least I would love to learn more about him and have found several useful links on the Wikipedia page. Elisabeth Elliot and other Christians have found much wisdom in The Practice of the Presence of God by Brother Lawrence. The first time I read it, it did not say much to me; perhaps I have grown enough to value it this time. Besides this list, I have various homeschooling, history of science, fiction, and other books planned for this year and, as always, I will continue to reread the Bible. What are your reading plans for 2019? I pray God will bless our reading this year, to his glory and to the benefit of our families, our various communities, and ourselves. Posted in: 52 Books in 52 Weeks, challenges, Planning. I didn’t realise that when I made a page for the reviews that my original linky wouldn’t work! Thank you, Carol. Now to find time to read….